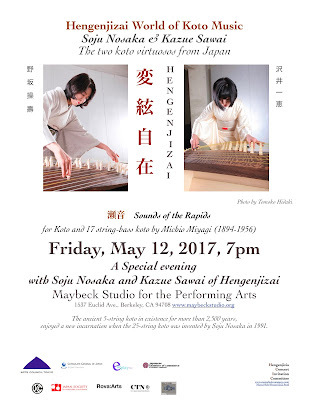 Hengenjizai is a concert project founded in 2011, organized by the two Japanese koto virtuosos, Soju Nasaka and Kazue Sawai. They are pioneers of contemporary koto music, who have been active on the front lines of the contemporary music world. 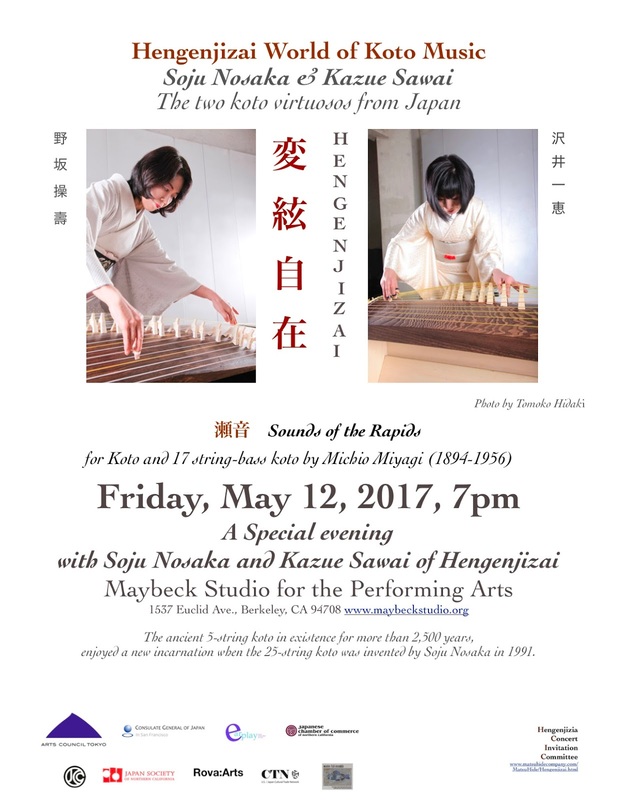 In this project, the two koto virtuosos have performed together throughout Japan. Their splendid, dynamic, elegant and rich performance enraptures audiences. After the concert please join us for a minor refreshment. Soju Nosaka is the pioneer of the 20-string, 21-string and 25-sting koto. She is a special guest Professor at the Toho Gakuen College of Drama and Music, and Executive Director of the Nihon Sankyoku Kyokai. In 1991, she played her newly developed 25-string koto for the first time. Nosaka received the Matsuo Award for Excellence in the Performing Arts the following year. Although Keiko Nosaka’s 25-string koto is a new development from the early 1990s, a 25-string zither by the name of se (Japanese, shitsu) was an important instrument of ancient China. Its muted elegance was often the subject of poetry. A legend concerning its origin can be found in the Classic Poetry (Shi-jing), while an excellent example of the instrument with its strings intact and movable bridges still standing was unearthed in 1972 from the Ma Wang Dui tomb in Changsa, Hunan Province, which dates back to the second century BC. Although the Japanese koto and the Chinese se differ somewhat in construction, it is of great significance that we can again hear the possibilities of the 25-string zither after so many centuries. This piece was inspired by the narrative poem Pipa Xing (“The Lute Ballad”) by the Chinese Tang-dynasty poet Bo Ju-yi (772–846). He is said to have written this poem when he was relegated to a minor governmental position in the provincial town of Jiujiang, on a branch of the Yangtze River. One autumn evening, he went to the riverside to bid farewell to a visiting friend. Exchanging parting cups of wine in the boat by which his friend was to depart, they heard the sound of someone playing a 4-stringed lute in a nearby boat. Reminded of the old performance style of the capital, the poet asked the player where she was from and learned that she had, indeed, once been a celebrated player at the Imperial court of Chang’an. Struck by their shared misfortune, he requested another piece, and she responded with a fast but mournful tune that left the men in tears as they listened by the light of the autumn moon reflected on the surface of the river. The composition borrows some aspects of the form of the poem, and has a free three-part structure.